Sensor readings Mindsensors Glide AS with EV3 problem | Christoph Bartneck, Ph.D. I was working on a new version of my Spirograph Automaton and once I fired up the EV3 software on my computer it informed that a new version was available, including a new 1.06H firmware. I installed both and expected my software to work as it did before. I got some very strange sensor readings. One sensor seemed to overwrite the value of the other sensors. Moreover, once I unplugged and reconnected the sensors it sometimes seem to work again. After rebooting the EV3 it sometimes worked and sometimes it did not. These types of intermittent problems are really annoying and it took me more than an afternoon to figure out that it was not my poor programming skills that caused the problem. Eventually I made a video of the problem and contacted the Mindsensors support. You need to right click on the EV3 software and select “Show Package Contents” to get into the desired directory. 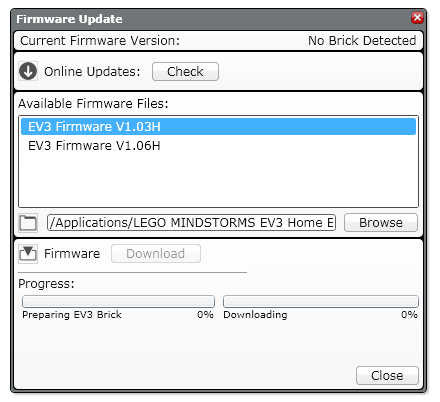 The firmware will then show up in the list of the available firmwares in your “Firmware Update” under the Tools menu in the EV3 desktop software.